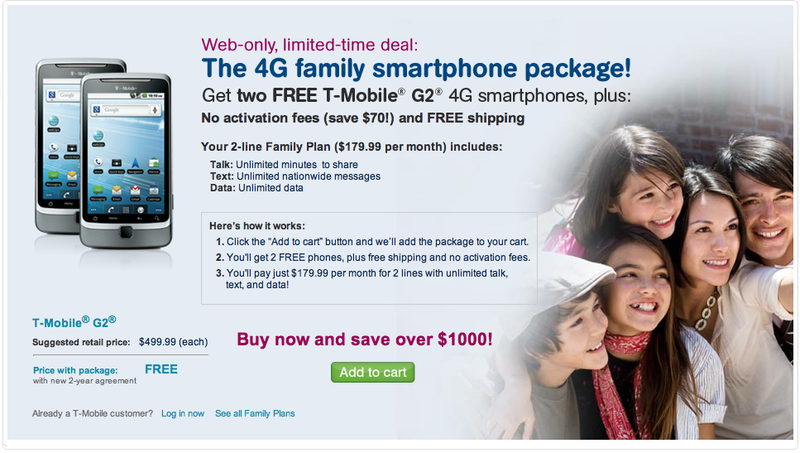 T-Mobile is currently running a “Web-only, limited-time deal,” that offers two free T-Mobile G2 4G smartphones when activating a two-line $179.99 family plan. As a quick recap the $179.99 family plan is unlimited everything: voice, text and data. On top of the free phones you’ll also receive waived activation fees ($70 value) and FREE shipping. No word on whether or not this offer is good for qualified upgrades but as a web-only offer, I’m betting this is for new customer accounts only. THIS is how to get a free phone! Good move TMo. Can we get some news about the big sale on 2-11 and 2-12? With that monthly price tag, they better be giving those G2s away with the activation fees waived. Still, that’s cheaper than the competition from the other 3 networks. If your wife talks over 4000 minutes and you use over 5gb of data would you pay about $81 including tax and insurance per phone each month without worries of being charged overage? That’s where I’m at and I consider it reasonable though not cheap. If any tmobile reps have any ideas of a better plan for us please let me know. I pay $147/mo for MyFaves, 750 minutes, free M-M and nights/weekends, ‘unlimited’ data, and 400 msgs. I can get a 300 minite plan for about the same $ without MyFaves. This is actually interesting, avoiding paying for phones, and in the end if I had to pay $199 ea for the G2s, it costs $12.50/mo extra over 24 mos if I factor the phone cost in. $9.60/mo if I factor in activations, and assume free shipping anyways. I might do this, though my wife has to accept a G2. She’s using a Curve now, and wants the better browser that Android brings. Maybe I will just call Loyalty and bust them for a deal on a Galaxy-whatever for her. I want a keyboard,call me old fashioned, but SSH into my servers with real passwords makes screen keyboards unbearable. My G1 is finally at the limit. Time to move up, and my only concern is that I’ll kick myself in the head for not waiting for dual-core. Good lord dude, thats a lot! LoL I pay 90$ a month WITH taxes for 1000, free nights/3 day weekends, unlimited messaging and data. I pay $74.99 before tax for unlimited talk, unlimited data, and 400 messages. Hmm, 50$ rebates on all HTC phones, free G2’s…some other deals going on….RIGHT before MWC. This is what we call clearing the shelves for new products. Good point… and also please note that most stores are really low on inventory. Lot’s of end of life product out there about to be replaced! Is that still 5GB unlimited? Umm no Thanks. Even free, I’m not interested. Waiting for those nice upcoming phone to land on T-Mobile shelves. This is still a great deal guys being that carriers directly normally don’t give away high end devices AND waive the activation fees. This is so Amazon of them really. I guarantee you all that only people like us are constantly wondering about the next big phone. These phones are expensive so for those looking for a great deal on 2 great phones with unlimited services you can’t go wrong unless of course T-Mobile doesn’t work too well in your area. Oh and I’m sure you can always change your rate plan online later on back to something cheaper. whats amazing is the link is already dead. this was posted early this morning feb 4, and 5:30pm pst feb 4 and the promotion has already “expired”. go figure. extremely limited time i guess. Great move on T-Mobile’s part. G2 is still an awesome phone that we all know is bound to get prompt Android updates…etc like the Nexus One enjoys. Not only that – T-Mobile needs to clean up storage for new devices…only thing is, if these new devices are as hot as I think they are going to be, then really they don’t need that much of a storage space to clean up since they’d all be flying off the shelves…lol. At least I’d hope so for our beloved Magenta. The G2 is already outdated. The only outdated phone that will always sell would be the iPhone 4. Plus, I don’t need unlimited minutes, I need unlimited text and data. You either are dumb or really dumb. If you are not looking to upgrade 2 lines now with unlimited everything, then shut up. Next time, read the article. I’m looking to upgrade 2 lines with unlimited everything but not for the ancient G2, that’s for sure. If you feel the G2 is “ancient” then you must be one of those people that buys a new phone every 3 months or so. The G2 is a fine device, nothing wrong with it. And no, I don’t own the G2–I just find it laughable that some of you are calling a phone that was just released “ancient”. ANCIENT???!?!???! NOTHING wrong with the G2!! Dude, even the Vibrant is not ancient, let alone the G2. Right now, I wouldn’t sign a new 2 year contract to just get the G2 for free. I’d rather pay $199 for one of the newer phones coming out soon. It’s different if the G2 is just not your cup of tea; but for some of these people to label as “ancient”?…now that’s crap. When they start enjoying their upgrades to new Android OSes and watch everyone else sit back and look on and whine will be the day I’ll relish. Granted the G2 is not MY cup of tea and I wont buy it I was in a position to get it for free, but it’s STILL an awesome phone. So those dogging it should stop!!! Now Kelrick, I don’t know your reason for not wanting the G2 for free since you didn’t state it in your comment. I’d like to know…just for the heck of it. If you don’t like the G2 or this promotion, then don’t get it. Why you feel the need to thumb your nose at an “outdated” (that’s a funny label you put on a phone just released) phone is beyond me. Perhaps you were having a bad day and decided to take it out on the G2? As far as the 5GB gripe–I’m a HEAVY daily data user and I may reach 2GB–in a peak month. I don’t see how anyone can reach 5GB. I’m guessing a very small number of people do, so this throttling of data shouldn’t be that big of an issue. As far as I’m concerned, if you’re hogging that much data, you’re abusing the system. Try putting your phone down and take in some fresh air or real life people face to face. Then you’re not a heavy data user. I always hear/read how someone hits their 5 GB every single month and their not tethering. Those are heavy data users. Like streaming music and video during their train/subway/bus commute to/from work. G2 rocks. I love my phone! Based on the discussions I am putting my money on the G2 since most of the pro arguments on it applies to me specially about my wive and here 5,000 words a day. To clarify, I have two lines with MyFaves, 700 mins, unltd data, 400 txt, M-M. That’s $143/mo. I can do 3000 min, data, unltd txt for same $ or unltd everything for what? $30 more? Happy to see T-Mobile appreciates my 10 years as a loyal customer… I’ll keep that in mind when shopping for my new phones later this month.